Green Island is located off Manly in Brisbane’s Moreton Bay. Unfortunately it has a reputation of having had more plastic visit it than people. So Ocean Crusaders set about changing that statistic by inviting the public to the island on Sunday 17th for one big clean up. Proudly Sponsored by Hideaway Handmade, with support from Construction People and Royal Queensland Yacht Squadron, 72 people turned up on the day, which was an amazing result for our little organisation. Amongst the crew were Greens Representative Ken Austin and local Councillor Peter Cummings, however the most impressive turnout was from the young families. So many children came along with their parents to experience what Ocean Crusaders is all about. Thankfully the team of Ben, Brady and Sue from RQYS attended with 3 of the club’s boats so we quickly loaded crew aboard and whisked them away to the island. It was a bit windy, however people loved the trips both back and forwards. On land Christine and I managed to register everyone and get them on boats. 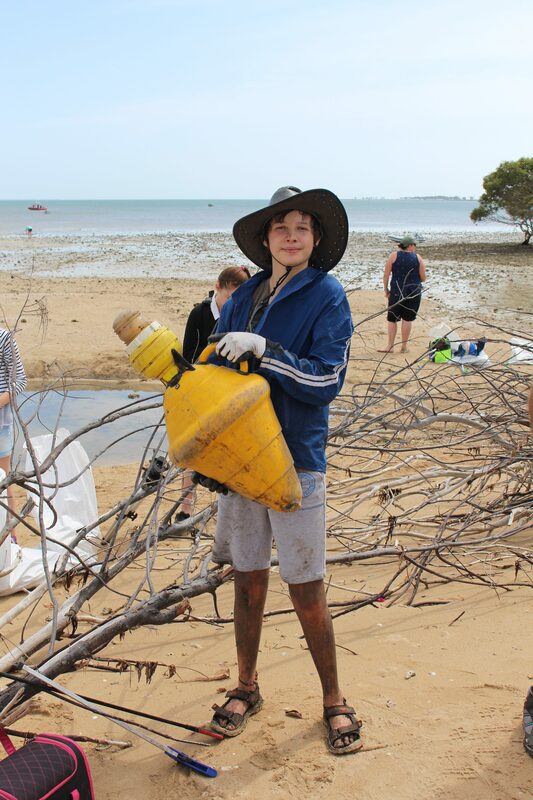 On the island and Annika, Gemma & Paul had everyone sorted, sending them into the bushes to clean up. It didn’t take long and the rubbish was coming back to the island. 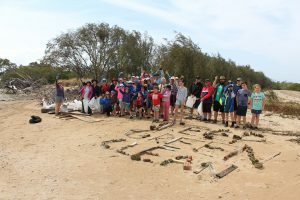 Darcy Richardson lead the team of children in making a sign that read ‘KEEP GREEN CLEAN’ whilst others headed deep into the mangroves removing more and more debris. Back on the mainland I had plenty of opportunity to talk with people walking the waterfront and so many people were so positive about what we were doing and asking when the next one was. Slowly but surely I started seeing some of the images coming from the island and was staggered at the quantity of debris the team on the island were removing. 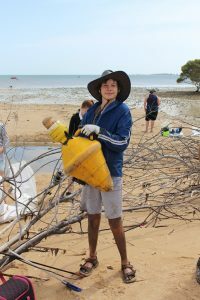 Children loved the cleaning tongs and wanted to pick up everything, whilst a team headed to the east side to tackle the dirtiest part of the island. Slowly people started to come home and back on the mainland, there were stories of what each person had achieved. The best part was that everyone was so happy with what they were able to achieve. Then our own work boat turned up with a full load. Bag after bag was removed and the weight in them was astounding. By 1430 we had everyone back and headed off to the club to have a bite to eat before the big sort. It was an amazing day and we thank everyone who joined us. A special thanks go to the Ocean Crusaders support team of Annika, Christine and Ian Richardson who helped us organise the event. Also a special thanks to those who helped us sort the debris. Paul, Andy & Gemma, Annika, Isabelle & Mick, Lesley, Logan & Liby, Ian & Darcy Richardson and Ian Miller. But the biggest thanks go to our amazing sponsors and supporters. Hideaway Handmade were our major sponsors of the day. Without their sponsorship, the day doesn’t happen. Construction People provided valuable marketing for the event and support in the organisation. The Royal Queensland Yacht Squadron came to the rescue when two of our transfer vessels pulled out on the Saturday afternoon. They came to the party by supplying an additional two boats to replace those we lost and without those boats, the day would not have been anywhere near as successful. I just ask that if you get a chance, please support these companies.